The orcs won’t see you coming if you go down this path, that’s for sure. Stealth in Shadow of War can be one of the most satisfying things – up to a point. With the way I like to play the game at least, stealth is more of a means than an end itself. I use it to get into an enemy camp, to scope out the enemy, to get close to the general or commander I’m targeting… and then I reveal myself, unleashing all of my combat skills. To get to that point you need to make smart use of the stealth skills and pick the right skills from the stealth skill tree, however. Middle Earth: Shadow of War’s predator skill tree is entirely focused on stealth and silent movement, and it has 19 skills you can use spread across it – but your skill points are limited, of course. What should you buy, what should you avoid, and what do all of those skills do? Well, here, we’ll get into all that. Let’s do it. The predator skill tree is built around stealth and associated skills – so that includes a lot of things that make you more agile and ensure you can traverse the world quickly. Many of these skills are useful even if you’re a bit of a klutz when it comes to sneaking around, as they can make escape or simply getting around much faster. 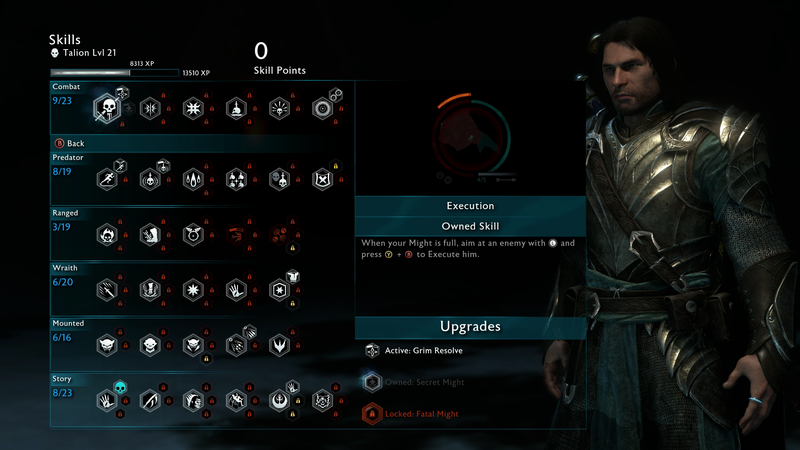 That means some of these skills can link up well with your the other Middle-earth Shadow of War skills. Which predator skills are the best in Shadow of War? Elven Agility is an ability that relies on timing and you might find it difficult to trigger at first, but once you nail it this skill becomes indispensable. Both of its upgrades are absolute must-haves, too. Get all three as quick as you can. Wraith Chain is probably the best overall skill on this list simply because it lets you chain together stealth kills – if you’re good, you could take out a whole small camp in a chain. The ability to stealth kill beasts from the Monster Hunter upgrade is also very useful. If you’re a truly stealth-focused player Deadly Specter is particularly amazing, though you really need to enjoy stealth to make the most of this one. Don’t underestimate the Poison Tendril, or poison in general. Yes, I know in an exciting game with sword combat and a hefty tree of combat skills waiting for your skill points it can be easy to forget this sort of stealth, but you can unleash serious havoc on large groups of enemies with this skill and its upgrades – and it forces the AI to interact in really interesting ways. This skill is a must-have, and gives you a sudden burst of speed when you hit Cross / A after jumping over something, landing from a jump or climbing. Its upgrades assist with stealth at speed. Silent Runner: A useful passive ability, this makes it so that sprinting doesn’t generate sound and thus orc attention. Spectral Dash: This is a little stealth dash – once purchased at level 8 or higher, tap Cross / A to jump forwards a short distance – you can also chain it into stealth kills, but it uses focus. If you remember the brutal aggression skill from the combat skill tree, Brutalize is the stealth version of that. Pressing R2 & Triangle / RT & Y will perform a brutal, frightening stealth kill that will boost your hitstreak combo chain and your might – perfect for kicking off a big combat encounter. The upgrades are centered around boosting the benefits of this type of kill. Unyielding Ferocity: This simply raises the bonus to your hitstreak and might. Reckless Hate: Enemies will be even more likely to run away in fear when they see you perform one of these kills. From level 11 up. Poison tendril lets you use your bow to poison buckets of grog, allowing you to take down orcs that way instead from afar. The upgrades increase the potency of this and offer more options for setting up ambushes. Bursting Toxin: Level 8 and higher – grunts who drink the poisoned toxin explode, and the explosion has a poisonous area-of-effect impact too. Contagion: This one is great – poisoned enemies go wild and begin attacking anything, even each other. Level 14 and up. Proximity Trigger: This is one of the best skills in this tree – it allows you to trigger hazards like Morgai Flies, Beast Cages and Bait from afar. Level 20 and beyond only, however. The Wraith Chain isn’t dissimilar to one of the Brutal Aggression upgrades in the combat skill tree – at the cost of focus, it lets you chain together stealth assassinations of enemies. Its upgrades enhance this and your stealth attacks further still. Monster Hunter: Available at level 10, this upgrade lets you use stealth kills on beast-type enemies. Shadow Blade: A simple but useful upgrade, this makes it so your first chained stealth kill doesn’t consume focus. 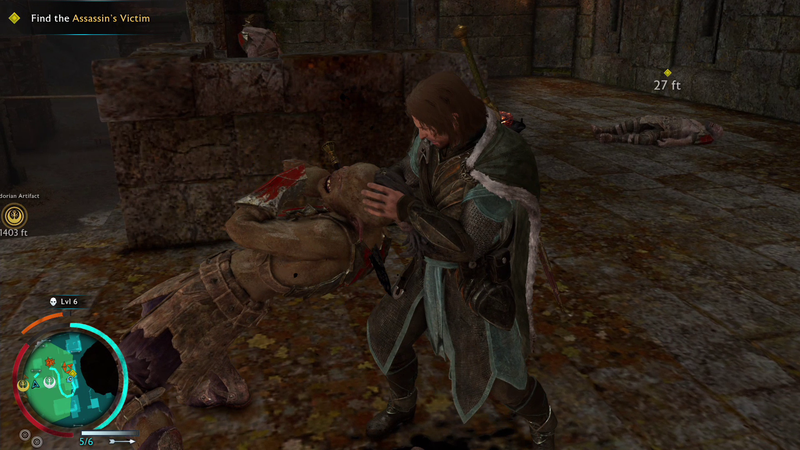 You can attract enemies to them to make them vulnerable in Shadow of War, but this skill makes that ability even more brutal and efficient. Hold down Triangle while using attract to have a Spectre do the killing for you. The upgrades make that wraith more efficient. Terrifying Presence: The wraith will perform a brutalize stealth kill instead, with all the attached effect. Level 12+. Spirit Drain: Level 20 and up, but your wraith will now drain the target too. This will unlock naturally without needing to be purchased, and lets you use a worm to send a death threat to a captain. This has various benefits for when you then face that captain down, resulting in a harder encounter but better reward gear. Worse than Death: Unlocked through completing Bruz quests. Shame befalls your target on defeat, lowering their level. It might also make them deranged – but there’s a small chance this can backfire and make them a maniac. Vow of Violence: A bonus objective gets added to Death Threat quests, and completing it yields extra rewards. Level 22+.